Herbert Benson, M.D., Associate Professor at Harvard medical School, is known as the “Father of the Relaxation response,” a method used to cope with stress and its results, e.g. elevated blood pressure. Since the mid- 1970’s Benson has been on the cutting edge of mind body medicine. His most recent book, The Relaxation Revolution, co-authored with William Proctor, J.D., presents the latest scientific data that validates the effectiveness of relaxation as a therapeutic tool. In our lead article, “The Coming Relaxation Revolution: Introducing Evangelical Christians to the Science and Genetics of Mind Body Therapy,” Benson and Proctor make a case that relaxation techniques are compatible with the Christian belief system and suggest ways that evangelicals can practice the Relaxation Response to attain better health. An informative interview with the authors follows the article. Our next article “Did Paul Create Christian Identity?” comes from the scholarly pen of Brian Tucker, professor at Moody Theological Seminary. Tucker builds on the research of William S. Campbell, who understands Paul to be “the architect” of the church because he insists that Gentiles be included as equals with Jews “in Christ” without Jews losing their own identity as Jews. Tucker interacts with Lieu, Holmberg, and Esler, among others to build a case that Paul formed unique, local expressions of social identity within the Christ-movement throughout the Mediterranean basin. With Karl Barth’s rejection, in toto, of the concept of general revelation, others have questioned whether nature has the capacity to reveal God and, if so, to what extent. Daniel Howard tackles these questions in his article “A Critical Analysis of General Revelation.” He evaluates the various theories of knowledge, distinguishes between nature, human nature and history as avenues of divine revelation, and explores what can be learned about God through general revelation. The editor takes CTR readers on a journey to the Appalachian mountain range where they are introduced to the ritualistic practice of picking up deadly serpents. In his article, “Snake Handling and Mark 16:18: Primitive Christianity or Indigenous American Religion,” the editor analyzes the claim that Jesus sanctioned the practice in his Great Commission discourse (Mark 16:17-20), and that modern-day participants are divinely protected as they worship God while waving these poisonous asps in the air. When the evidence for the support of snake handling is examined critically, one discovers a twentieth-century origin for the practice and a psycho-biological reason for its success. German scholar Helmut Utzschneider contributes “The Book of Job and the Aesthetic Theology of the Old Testament,” in which he examines how perception (i.e. the exercise of the senses) is used as a literary device throughout the book. Utzschneider shows how Job perceives reality through the five senses (“syn-aesthetics”) and how Yahweh invites him to view the world through his divine eyes (“theo-aesthetics”). 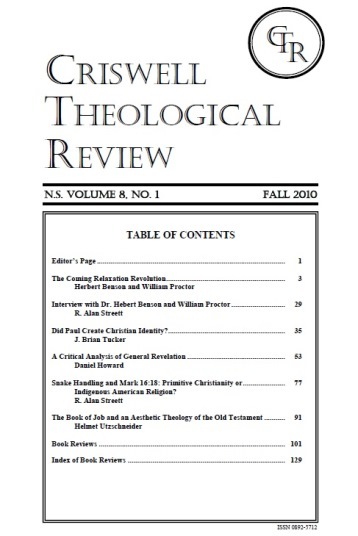 The Fall 2010 CTR concludes with 28 pages of book reviews. We offer these reviews to help you as you choose which books to purchase for your personal library.